On March 19, CCI Wireless visited the Stollery Foundation offices and presented a donation that will benefit kids around our province. 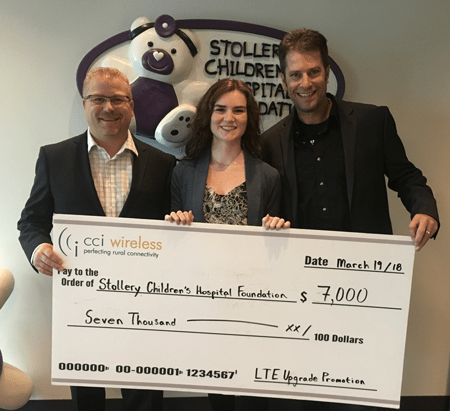 In the fall of 2017, CCI launched a campaign to benefit the Stollery Children’s Hospital Foundation in alignment with our expansion of LTE services across the province. In particular CCI upgraded eleven towers surrounding the Grande Prairie and Slave Lake regions. Given the amount of time our teams spent in the area completing the work, we felt it was an excellent opportunity to give back to the community; and a perfect fit for a charitable campaign came along! While our LTE upgrade allows our customers to access our current and future fastest plans, the Stollery’s mission to create a “Network of Care” across Alberta allows kids from all over the province to get medical care without heading into the city. We loved the connection between providing previously inaccessible services to rural Albertans (Not that we would compare our work to that of life-saving pediatric nurses and doctors!). “It’s a great honour to give back to our communities, notably through such a deserving foundation as Stollery. At CCI Wireless, we have committed ourselves to enhancing our communities through philanthropic efforts. Through their Network of Care campaign fits the values of CCI perfectly, and we are able to touch many young lives in a positive way when they are most in need. CCI ran a campaign through online ads and special flyers sharing the Stollery’s mission, and announcing that we would donate $25 for every customer who upgraded to LTE service. This donation rose to $50 for brand new customers on these towers. Our first donation from the campaign occurred on March 19th, based on the upgrades and new customers from October 2017 to Feb 2018 and our initial gift was $7,000! This promotion is ONGOING, so CCI will have the privilege of making another donation this summer. If you are a customer on any of the qualifying towers, why not upgrade to LTE now?! Wherever the upgrade is available, we’ll do it for free on a new two-year contract. CCI gives a special shoutout to Stollery staff Cyndi, Kylie and Ryan, who have helped us throughout this campaign. CCI’s longstanding commitment to the Stollery started in 2014, when we participated in a fundraiser in partnership with our owners, who are members of the Federation of Alberta Gas Co-ops. During the “FedGas 50th for Kids” fundraiser, we matched contributions from our fourteen gas co-op owners and donated $25 on behalf of every new customer we earned. The donation benefited both Edmonton’s Stollery and Calgary’s Alberta Children’s Hospital. Want to get involved with the Stollery? The Stollery has a range of amazing programs and fundraisers. 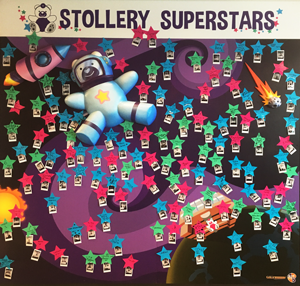 This is a display of the Stollery’s “Superstars” – kids who have given their own money to the Stollery. Each star is attached to a picture of a generous kid who donated whatever they had. Many of the youngsters featured here gave up their birthday money to help sick kids. There is nothing cuter than a five-year-old looking so proud to be holding a novelty cheque! You can check out this program or other opportunities to get involved on their website. LTE connections, or “Long-Term Evolution,” use new equipment to handle the explosion in volume of data that users now need. It provides a better connection for increased data delivery and lower latency. To have an LTE upgrade, we need to install new equipment on your home. Customers can choose to get the upgrade for $150, or have it for free on a new two-year contract. You will receive both a new outdoor radio, and a new indoor modem that will improve the Wi-Fi signal in your home. An upgrade to LTE will allow you to choose a higher speed plan in the short-term, and also access our future higher speed plans in the longer term. Watch our website, your email inbox and our social media sites for updates about LTE availability and new residential plans! Do you know of a charitable cause we should donate to, or an community event that needs sponsorship? Send information about Albertan, non-profit projects that match our identity and values to customercare@cciwireless.ca.